Croatian authorities have launched an investigation into the captain of the national football team, Luka Modric. The midfielder, who also plays for Real Madrid, is suspected of making false statements at the tax fraud trial of Zdravko Mamic, his former manager. He could not immediately be reached for comment, Reuters news agency reports. Mr Mamic, a powerful figure in Croatian football, was Mr Modric's boss at leading club Dinamo Zagreb. Mr Mamic, his brother Zoran Mamic, and two others are accused of corruption that reportedly cost Dinamo Zagreb more than 15m euros (£13.1m; $16.7m), and the state 1.5m euros. Cash is said to have been embezzled via phoney deals where they took a cut from the sales of players. If found guilty of perjury, Mr Modric could face between six months and five years in prison. Mr Modric was asked to testify about his multi-million pound transfer from Dinamo to the English club Tottenham Hotspur in 2008. The perjury allegation hinges on exactly when he signed an annex to his contract with Dinamo, setting out the terms for future transfer fees. 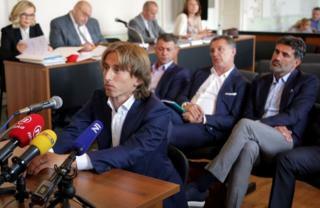 According to prosecutors, at a tribunal on 13 June, Mr Modric falsely said he had signed it in July 2004. Prosecutors say the annex - which allowed Mr Modric to receive half the transfer fee - was actually signed in 2008 when he had already left the club. Prosecutors also say Mr Modric told investigators in 2015 that the annex had been signed when he had already been sold to Tottenham. The state attorney's office believes the player changed his testimony in his former manager's favour. The 31-year-old looked visibly uncomfortable while giving evidence to the trial, which has attracted huge media interest in Croatia.